Spicy fried rice pan fried w/ onions, garlic, & your choice of chicken, beef, or pork. Shrimp $1 more. Fried rice w/ your choice of chicken, beef, or pork, mixed together w/ onions, eggs, & grilled garlic...thai style. Shrimp $1 more. Eggs & fried rice w/ the sweet taste of pineapple chunks mixed in. Optional chicken, beef, or pork mix-in as well. Shrimp $1 more. Fried rice, eggs, & onions, mixed to perfection w/ real crab meat. Coconut soup mixed w/ thai herbs & spices, lemongrass, lime leaf, cilantro, baby corn, mushrooms, onions, & tomatoes. Choice of chicken or tofu. A thai original, a spicy & sour taste w/ chicken, mushrooms, baby corn, lime leaf, lemongrass, tomatoes, onions, & cilantro. Shrimp, shrimp balls, mushrooms, baby corn, lime leaf, lemongrass, tomatoes, onions, & cilantro w/ a sweet & sour twist. 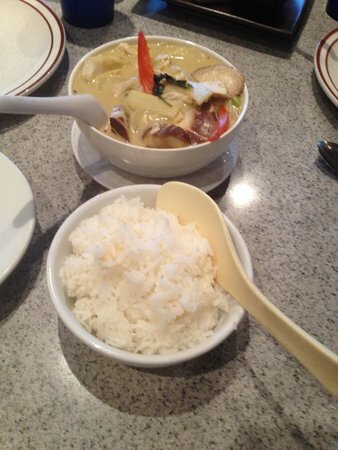 All salads are served w/ your choice of sticky or steamed jasmine rice. Thinly sliced steak, onions, tomatoes, toasted rice powder, cilantro, & a side of cucumbers. Finely ground meat chopped w/ mint leaves, thai herbs & spices, onions, & toasted rice powder w/ lettuce & cucumbers on the side. Your choice of beef, pork, or chicken. The thai papaya salad is what thailand is known for, shredded papaya & carrots, finely mixed together w/ tomatoes, lime, roasted peanuts, giving you the perfect spicy kick. Served w/ cabbage on the side. Glass noodles, mixed veggies, green & red onions, bell peppers, & lemongrass, w/ our thai drift sweet & sour dressing & a hint of lime. Optional pork add in for $1. Mixed veggies & seafood, green & red onions, lemon grass w/ our thai drift sweet & sour dressing & a hint of lime. Mixed seafood contains, shrimp, mussel, fish balls, scallop, & calamari. Rice noodles, meatballs, thinly sliced steak, bean sprouts, onions, & cilantro in a delicious noodle soup. Added shrimp for $2 or $1 for shrimp substitution. 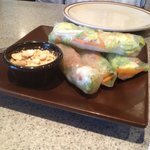 Pan fried rice noodles, eggs, onions, w/ your choice of beef, chicken, or pork, topped off w/ bean sprouts, & roasted peanuts. Shrimp $1 more. Pan fried rice noodles w/ assorted vegetable & eggs, mixed w/ dark soy sauce, your choice of chicken, beef, or pork. Shrimp $1 more. Pan fried glass noodles, eggs, assorted vegetables, & your choice of chicken, beef, or pork. Shrimp $1 more. 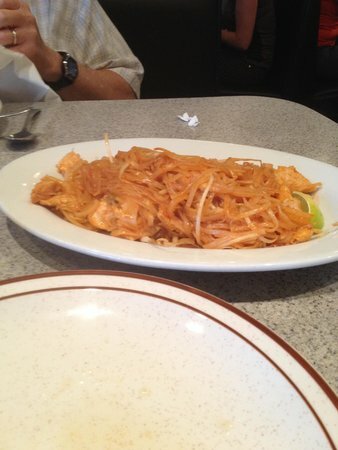 Sweet pan fried (thin) rice noodles, onions, bean sprouts, assorted vegetables, & your choice of chicken, beef, or pork. Shrimp $1 more. Pan fried wide rice noodles, broccoli, bell peppers, onions, thai basil, & spicy peppers w/ your choice of chicken, beef, or pork. Shrimp $1 or seafood mix for $2 more. A delicious peanuty taste to your curry, w/ your choice of chicken, beef, or pork, w/ potatoes, & topped off w/ cashew nuts. Shrimp $1 more. Thai herbs blended into a curry w/ your choice of chicken, beef, or pork, w/ eggplant, bell peppers, & lime leaf. Shrimp $1 more. Potatoes, bell peppers, bamboo, & onions, a mild curry yet addicting taste, your choice of chicken, beef, or pork. Salmon $2 more, shrimp $1 more. Eggplant, bell peppers, bamboo, a mild taste yet spicy curry, your choice of chicken, beef, or pork. Shrimp $1 more. Bamboo, onions, basil, & potatoes, the mother of all curries, your choice of chicken, beef, or pork. Salmon for $2 more, shrimp $1 more. Pineapple, bell peppers, bamboo, & onions, w/ a dab of sweetness to your curry, your choice of chicken, beef, or pork. Shrimp $1 more. Bell peppers, onions, bamboos, thai basil, & sweet asian pumpkin, w/ your choice of chicken, beef, or pork. Shrimp $1 more. 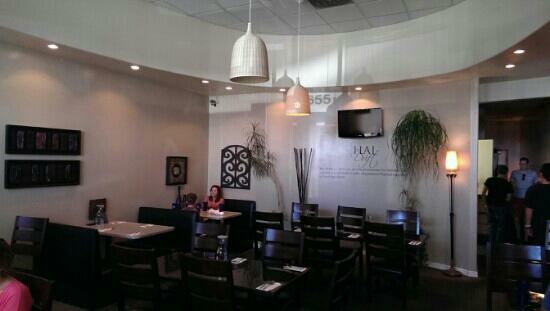 All entrees served w/ your choice of sticky or steamed rice. The original but all time favorite stir fry, your choice of tofu, chicken, beef, pork, or vegetarian. Pan stir fry seafood w/ a mixture of thai herbs, this entree is preferred spicy, but can be mild, seafood contains shrimp, mussel, fish balls, scallop, & calamari. Chicken, beef, or pork, stir fry w/ peppers, onions, ginger, & a slight spicy twist. The name says it all...pan fried chicken glazed w/ a wonderful garlic taste. Stir fry chicken, beef, or pork, assorted vegetables, & cashew nuts. Eggplant,​ stir fried w/ green beans, onions, thai peppers, & basil. Optional pork, chicken, vegetation mix-in (no additional cost). Tender marinated steak stir fried w/ broccoli, carrots, & onions. Assorted vegetables w/ your choice of chicken, beef, or pork, stir fried together, w/ a touch a basil. Salmon for $2 more. Your choice of chicken, beef, or pork assorted vegetables, bamboo, onions, & bell peppers, stir fry to perfection w/ a hint of curry paste. Sweet rice pudding mixed w/ coconut milk topped off w/ mangoes. Sweet rice mixed w/ coconut milk, optional ice cream mix in for $1 more. Bananas in tempura batter deep fried w/ a side of ice cream. Fantastyczne jedzenie i wspaniała obsługa! tutaj przez cały czas i to zawsze dobre. Bardzo czysty i wspaniała atmosfera. Pojedziemy jeszcze raz. Moje ulubione danie to ich nadzieję zamówić Massaman curry i pierogi. Nie da się pobić ich specjalny lunch, świetna cena, doskonałe jedzenie i szybka obsługa. Jest to lokalny przysmak dla mnie! Wspaniałe jedzenie, duże porcje, świetna na wynos i dzielenia się. Ich wyżywienia menu jest również pyszna. Byłem w tej restauracji kilka razy i muszę powiedzieć, że jest najlepsza! Byli bardzo gościnni, nawet wtedy, gdy ciągle zmiany i dodanie do zamówienia! Pyszne tajskie jedzenie. Najlepsze tajskie jedzenie w Utah Valley. Małe ale duże w smaku. Personel jest miły i będziesz zadowolony. Poszliśmy na obiad tutaj do pracy, a jedzenie było doskonałe. Było tam dużo nas, ale dostali nasze jedzenie dość szybko. Uzyskaj szybką odpowiedź od pracowników i klientów obiektu Thai Drift.